It’s been over a week since the Winnipeg Jets’ standout rookie Jacob Trouba was injured in a game against the St. Louis Blues. The 19-year-old defenseman went in behind the St. Louis net to try to make a play on Jordan Leopold, but missed the check and fell head first into the boards. Play was whistled dead as Trouba lay face down on the ice. He was stretchered off soon after, but managed to acknowledge the concerned crowd at the MTS Centre. Fortunately, Trouba will be fine. As the Winnipeg Free Press reported: “The team said later Trouba never lost consciousness and that he was alert and communicating, even before he was taken to hospital for X-rays and tests.” And, the Jets posted an update on twitter the following day, which included a photo of Trouba. With that in mind, there hasn’t been any official update on his condition in the past few days and Winnipeg’s defense took another blow Sunday when it was announced Paul Postma would be out indefinitely with a blood clot in his leg. The Jets have gone 1-2-2 since they came back to beat the Blues in a shootout after Trouba left the game. They scored more than two goals in just one of those five games and their only win came in a shootout against the Dallas Stars. With Trouba out of the lineup, Claude Noel has had to rely more heavily on other defensemen, including Grant Clitsome and Zach Bogosian. Both players have played more than 20 minutes in each of the last few games. While defense hasn’t been the biggest problem for the Jets, it certainly hasn’t been a strong point either. Trouba’s return could provide the jolt Winnipeg needs to get back on track. 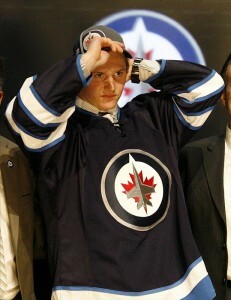 The 6’2″, 187-pound blueliner was selected ninth overall by the Jets in the 2012 NHL draft. He was a key contributor in the first eight games of the season, averaging 21:15 per game in ice time, the fifth most on the team. He tallied a goal, an assist, 11 hits and 12 blocked shots, playing in all game situations. In fact, he averaged 1:41 of ice time on the power play and more than four minutes on the penalty kill. Unfortunately for the Jets, they will face the Blues, Red Wings and Blackhawks (twice) over the next 10 days and it seems unlikely Trouba will return during that time. Trouba, however, has remained positive and made a few light-hearted remarks on twitter regarding the injury.